The problems caused by the recent virus attack in the Netherlands have not yet been over. Computers APM container terminal in the port of Rotterdam are down since yesterday. TNT Express also has trouble with the virus, which is doubtful whether it is called ransomware. TNT Express says the attack causes delay. In order to be able to continue working, is switched to another method. 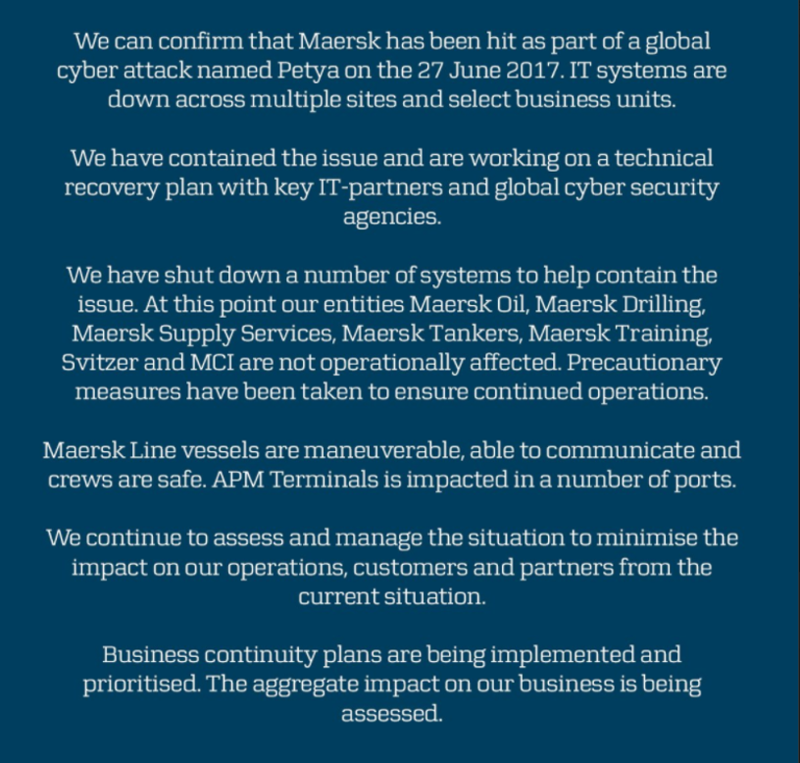 Maersk has been working on a plan to restore the damage caused by the attack this morning. Most of the 76 ports where the company is active have been hit by cyber attacks. The company has eliminated the problem by eliminating the multiple container terminals of the company, including those in Rotterdam. Earlier reports that in another way would be unloaded in the port of Rotterdam, held by the Managing Director of APM Terminals internal misunderstandings. The problems have not yet been causing bottlenecks. But if the problem persists, logistical problems may arise, says a spokesman. According to Arthur van Dijk, Chairman of Transport and Logistics Netherlands, the damage will be millions of euros if the attack lasts for a few more days. "Thousands of trucks can not transport freight. Containers are left, ships can not be discharged and we can not ship containers anymore," says Van Dijk. The consumer does not notice so much here, but that will change if it takes longer. "Delivery of clothing is delayed, vegetables and fruit and all kinds of other things remain on the quay." Because many other European countries also supply from Rotterdam, they will also be affected by the virus attack in Rotterdam.